Several weeks ago, I happened across some figures in a Walmart toy aisle that I’d never seen or heard of, but caught my attention. 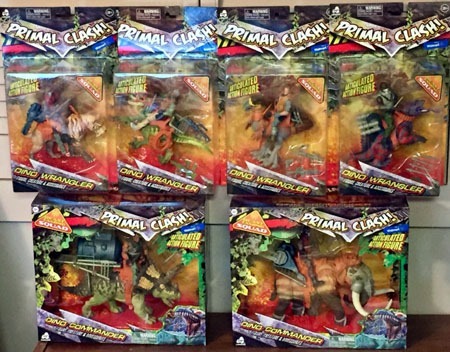 These Primal Clash figures caught my attention at Walmart tonight. 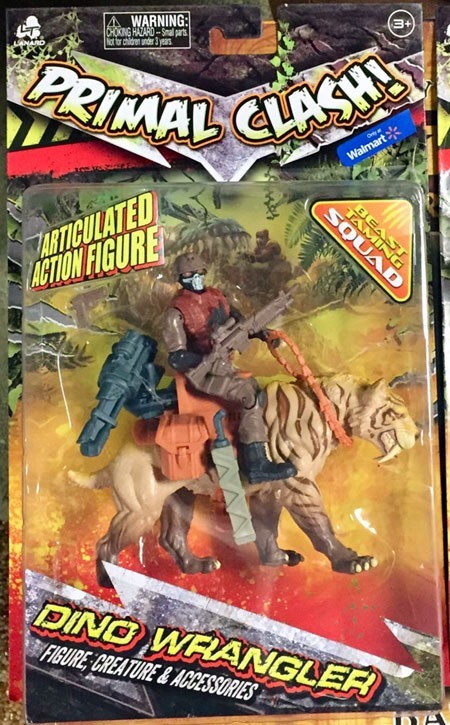 They look like generic $1-store things, but sparked my nostalgia for Dino-Riders! Though I initially just bought the Raptor, I ended up going back for the other three. And then last week, came across the two larger figures. These figures are from Lanard, a company that apparently has been producing toys for some time. 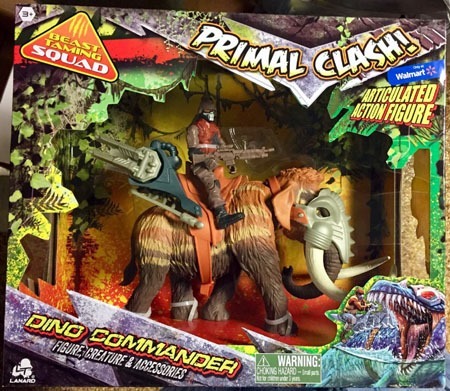 They apparently did the Rampage toys that were out last year for the movie, and they’ve been producing a line called The Corps. 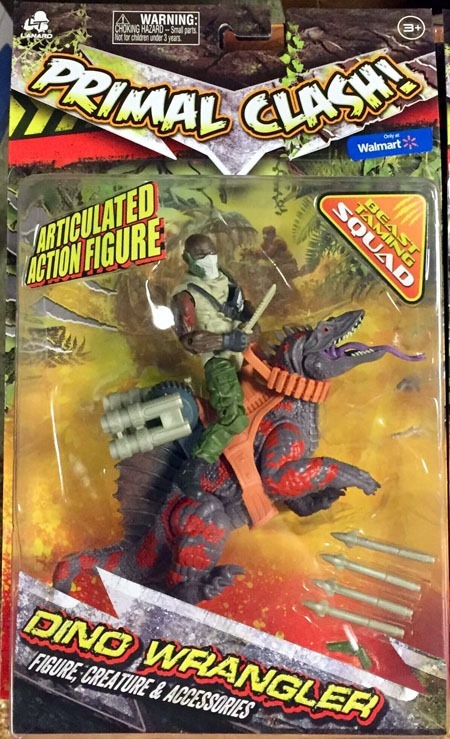 I’d seen that line in the toy aisles of Walmart before, and thought it was just some generic cheapo-thing; a low-end GI Joe to capitalize on there NOT being regular GI Joe (specifically A Real American Hero-variety) toys at present (shame it’s not brought back the way the Transformers have been! But that’s another post entirely). I’ve also figured out that Lanard has produced this particular line outside of the U.S. for at least a couple years, though under other names. 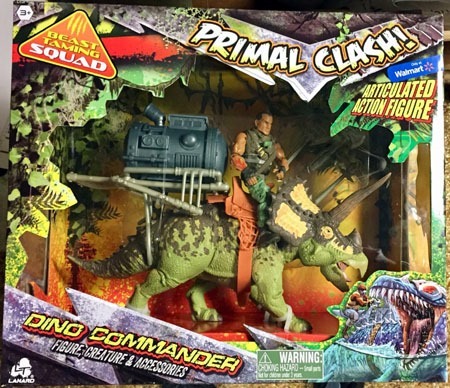 The most frequent reference I could find was Jurassic Clash…but that would be obviously “problematic” given Jurassic World having toys and such out. 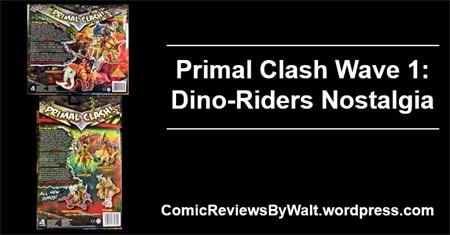 These figures REALLY spark my nostalgia for Dino-Riders (an ’80s toy line that many folks probably don’t remember or never knew about, but has a definite high-scale collector community, at least on Facebook). Being able to get these for $7 for a “full size” rider and dino, and only $15 for the larger…that’s a steal! Just the human figure would be $15+ from most other companies, and probably be in the $20-25+ range having the dino; the larger ones would likely be $30+! I’m definitely onboard for any other figures that show up in Walmart for this line. They’re presently marked as “Walmart exclusive,” but given I have two Walmarts I get to regularly within a 15-minute drive, with a couple more in a slightly broader radius, and 2-3 others that I’m fairly regularly “in the area,” I’m not personally all that bothered by the “exclusivity” since I have the easy access. Chain-exclusive toy lines are generally their own issue to me, though, and the subject for some other post. The Raptor most caught my attention, given the prominence of the Velociraptors in the Jurassic Park/World films. 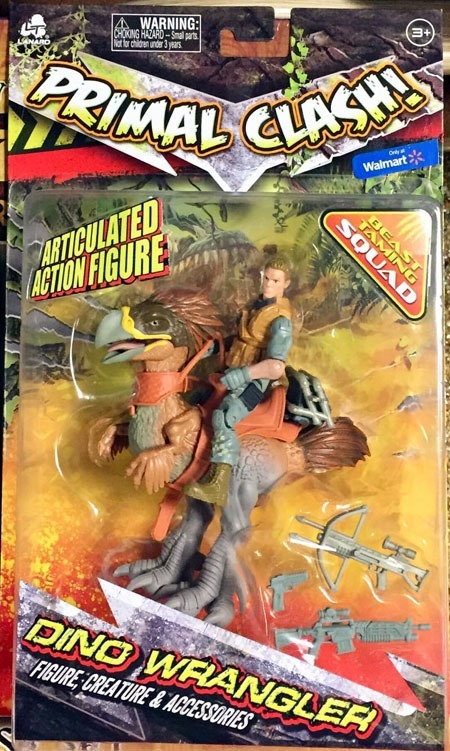 I also remember having the Dino-Riders velociraptor (or deinonychus, whatever the case, essentially the same visual). Titanis is a creature I’m unfamiliar with…whether that’s the name of this one as a creature or as a specific character, I’m not sure. I saw some references to it as a “Terror Bird” or such; and I do like the sculpt! The Sabretooth Tiger kinda speaks for itself. I like the sculpt, and it fits the Primal Clash name. May not be a “dinosaur,” but tends to get lumped in with them; certainly doesn’t bother me seeing it in this group. I don’t know what a Trimetrodon is, though I’m pretty sure I remember a similar fin/sail-backed dinosaur as a dimetrodon. Given the looks of the riding gear, this could be a “variant” on that…whatever. It’s not a horrible sculpt, but of these first four, it’s probably my least-favorite. 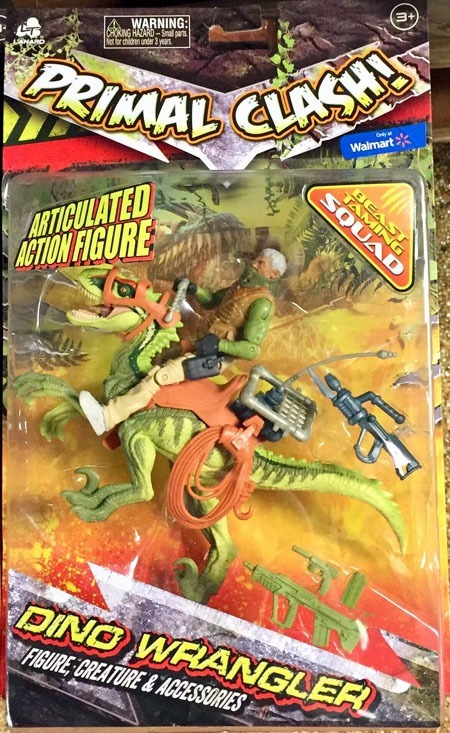 Apparently for the toy line, there are the Dino WRANGLERS…and Dino COMMANDERS. The wranglers apparently have smaller dinos, while the wranglers have the larger ones. I really like the Triceratops sculpt! I’m less impressed with the Mammoth sculpt…perhaps because the headgear is such a similar color to the tusks, making it look like “just” a hairy elephant with headgear, to me. Once I get it out of the package, we’ll see how my thoughts on it change, though! Here’s the card-back for the four. I definitely REALLY like that the entire basic “wave” is shown, so that even if there’s only one figure handy/in-stock, one can see what other ones exist. I’d be even more enamored with it if the larger ones were also shown…but c’est la vie and all that. 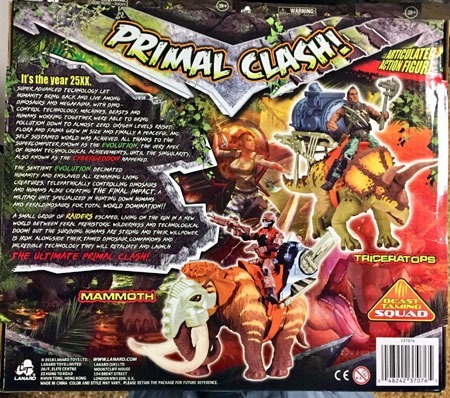 Here’s the card-back for the Mammoth and Triceratops. Same deal…it’s nice to see both represented, though a shame that the other figures aren’t also shown. Finally, here’s the text of “the story” behind the figures. While it’s not much it’s better than nothing at all! 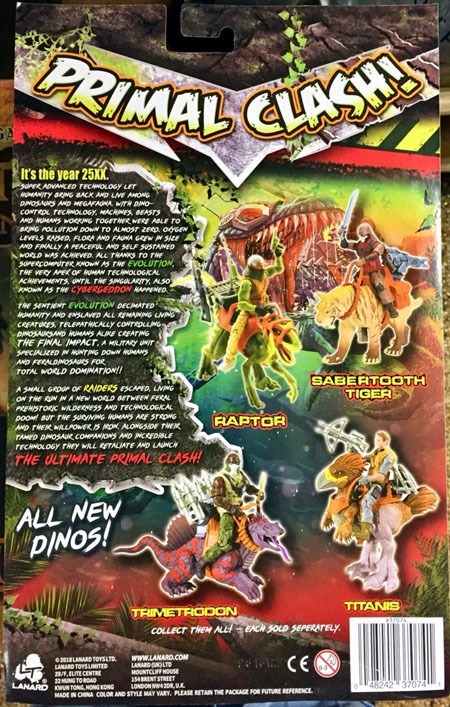 I’d really enjoy something more in-depth to “support” these toys…such as individual bits for each rider/dino, if not some sort of publication (novel/comic book/something). And a cartoon series would be quite interesting, especially as an alternate narrative to the Jurassic World side of humans/dinos existing together. Stories of the small group of Raiders and their dinos having to survive and fight back against the Final Impact, while looking for a means to take out the “mastermind” Evolution supercomputer…you’ve got your “good guys,” “bad guys,” and “big bad” right there. Plenty of room to fill in with specific characters. Who’s the leader of the Wranglers? The Commanders? Would these be “factions” or “sub-factions” of the Raiders? Do they get along, or is there bickering? How rigid or formal would the titles be? 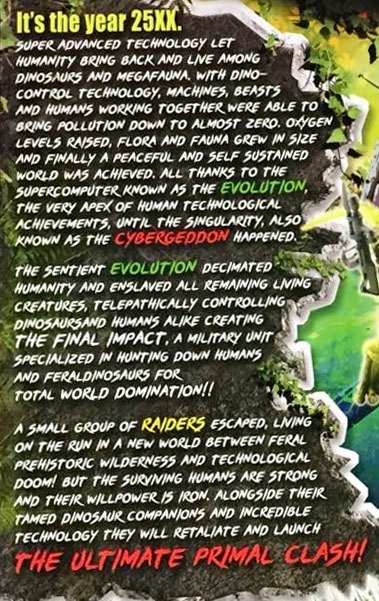 This “story” seems almost like an “elevator pitch” for a wider world…and though I know there are several further human characters and another “Dino Commander” dinosaur as well as a couple of larger creatures–a Tyrannosaurus and some sort of giant ape–i’d be curious about additional dinos and riders. 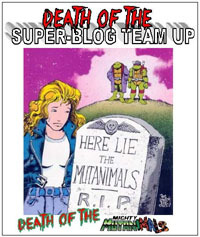 To say nothing of the fact that–as far as I can tell–we don’t have actual names for these humans, and though I questioned Titanis above, that’s likely not a unique/specific/character name…so there’d be room for us to have specific characters in both the humans and the dinosaurs. Given I only JUST discovered these in January 2019, and know there are several more that could come this year, it’ll be interesting to watch and see what else comes out, and if or how popular these might be. For whatever it says, though I’ve long been a fan of Jurassic Park/Jurassic World, I did not buy any toys from Jurassic World: Fallen Kingdom, and had only bought the Indominus Rex, Tyrannosaurus, and a 4-pack of the main Velociraptors back in 2015.